"It's just dirt, nothing to see here" was Michael Pineda's general reaction to being accused of glopping up the heel of his hand with some unknown substance in a strong pitching performance against Boston last night. It clearly wasn't dirt. But was it cheating? That depends on whether you listen to baseball's rulebook or to baseball players, because this is one of those things that are technically banned, yet everyone does it anyway. Pineda pitched six innings of one-run ball in a 4-1 Yankees victory, striking out seven along the way. For the first four of those innings, a brown, sticky substance was clearly visible to TV viewers. Images started spreading on Twitter first, and by the time the NESN broadcast started talking about it in the fourth inning, it was clearly going to become the story of the night. "Now why don't you run down and tell John Farrell about that?" Jerry Remy joked. Boston manager John Farrell said he was made aware of the substance in the fifth inning, and began looking for it. By then, Pineda's hand had been wiped clean. The umpires said they were never alerted to it, and so couldn't have done anything. "It's dirt," Pineda told reporters. "Between the innings, I'm sweating too much on my hand. I'm putting dirt (on it)." (6) deliver a ball altered in a manner prescribed by Rule 8.02(a)(2) through (5) or what is called the "shine" ball, "spit" ball, "mud" ball or "emery" ball. The pitcher is allowed to rub the ball between his bare hands. But actual baseball players draw a distinction that the rulebook does not. Loading up a ball with gunk to give it extra, unexpected action? A violation. Keeping a supply of pine tar, rosin, or sunscreen (or a mixture) on a pitcher's hand or arms to get a better grip on a cold, windy night? That's totally fine. David Ortiz: "Everybody uses pine tar in the league. It's not a big deal." David Ross: "A lot of guys make sure they get a grip in cold weather. I don't think of it as cheating." "You can use rosin, water, the whole sunscreen stuff, whatever," Buchholz said. "It's either, have a grip on a baseball and semi-know where it's going, or don't have a grip at all and get somebody hurt. If you're scuffing the ball, that's one thing, but if you're actually creating more control by throwing it where you want to, that's the game of baseball. As long as I've been around, I've never seen any kind of sticky substance give anybody an edge." It's barely even an edge, if everyone's doing it. In the wake of the Buchholz controversy, Yahoo's Jeff Passan spoke to veteran pitchers who estimated that 90 percent of pitchers use spray-on sunscreen, mixed with rosin, to give them a better grip on the ball. This would be illegal by a strict interpretation of the rules, but if the playing field is level, no one's going to make too much a stink about it. Is it really that common? It would seem so, given that Pineda wasn't the only player to be caught piling on the sticky stuff. 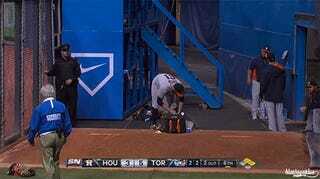 Via Blue Jays Plus, here's a gif from of Astros reliever Josh Zeid, loading up his forearms with sunscreen before coming in to pitch on Wednesday. It was a night game. In a dome. Tom Verducci, who wrote that "most pitchers, not all" use some sort of substance to improve their grip, says it's a science. He quotes from Out of My League, the book by former reliever Dirk Hayhurst (who happened to be part of the Toronto broadcast team questioning Buchholz last year). Hayhurst wrote about what's inside those backpacks pitchers carry to the bullpen. He wrote when describing the unpacking of the bag: "Then the real supplies came out: various goops and stick 'ems that some morally sensitive fans would call the use of cheating, while we in the business simply called having an edge." Those substances, Hayhurst wrote, include something called "Firm Grip . . . a knockoff of pine tar," shaving cream ("specifically the gel stuff") and sunscreen. "When rubbed into the skin and mixed with sweat and rosin," Hayhurst wrote, "this stuff actually forms an SPF-40 caliber Fixodent, which a crafty pitcher can mix on the fly. 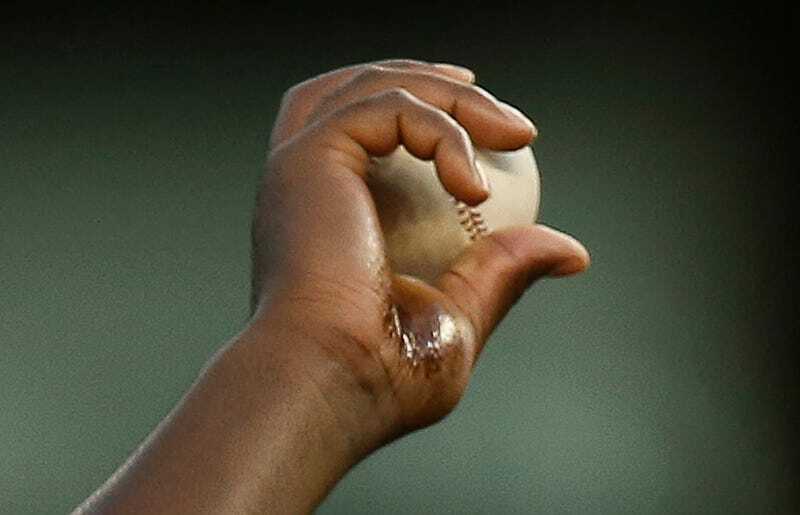 A touch to the wrist slightly below the mitt for some [sun] screen, a wipe of the back of the neck for some sweat, a pat of the rosin bag for the third component, and you'll have enough tack to make the ball hang from your fingertips." So, back to Pineda. His opponents didn't care, the umpires didn't get involved, and MLB won't do anything unless Red Sox management makes a stink, which they don't seem inclined to do. This seems to be one of those things the fraternity of pitchers has collectively decided to ignore for everyone's sake—Pineda's only crime was not being discreet about it. "Guys look to create a grip," John Farrell said, "but typically you're not looking to be as blatant."